We at The Shears Depot also carry beautiful Shear Sets in different designs and colors for our customers. These shear sets are excellent to put your shears in while using them on a daily basis. They are durable, long lasting and very trendy as well. Our shears sets are designed to carry two shears as well as upto four shears along with a razor and some extra finger inserts. The Shears Sets at display here have been filled up with tools though the price you see is only being offered for the shear set itself. You can purchase the shears from other categories on our website and the Shear Set at a low discount price for your shears. Description: A pink shear case which can carry 4 shears, a razor, oil tube, combs & extra finger inserts. Ideal for cosmetology students. Description: Perfect for cosmetology students. Can carry up to 4 shears, a razor, oil tube and extra finger inserts. Description: A beautiful shear set made with Zebra print leather. Can carry 4 shears, a razor, oil tube and extra finger inserts. Description: An excellent shear casing in pink color. It can carry up to 4 shears, a razor, oil tube and extra finger inserts. Description: A black color hair shears set with see through glass. It can carry up to 2 shears, a razor, oil tube and a couple of extra finger inserts. Description: A black color shear set case which can hold up to 2 shears, a razor, oil tube and a couple of extra finger inserts. Description: A two shear set made of pink leather casing with a see through glass. A very nice and beautiful looking shear set. Description: A two shears set made in pink color leather casing. A lovely product to carry your shears in. A treat for beauty school students. Description: This is a very nice shear set that can carry up to two shears made in a zebra print leather casing. It can also carry a razor, oil tube & a couple of extra finger inserts. Description: A beautiful design two shears set made of zebra print leather. It can carry a razor as well as an oil tube for shears servicing as well as a couple of extra finger inserts. 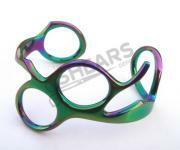 Description: A beautiful rainbow multicolor finish stylist bracelet. Free shipping!